Leah S. Yaw is the Senior Vice President of External Affairs at Devereux. She has been with Devereux since March 2009. As head of External Affairs, Ms. Yaw directs the fundraising, communications and public policy activities of the organization. Devereux Advanced Behavioral Health was founded in 1912 by special education pioneer Helena Devereux. What began as a small school in a private home serving 12 students has since grown into one of the nation’s largest non-profit behavioral healthcare providers, servings thousands of individuals and families across 13 states annually. Devereux Advanced Behavioral Health was founded in 1912 by special education pioneer Helena Devereux. What began as a small school in a private home serving 12 students has since grown into one of the nation’s largest non-profit behavioral healthcare providers, servings thousands of individuals and families across 13 states annually. Naturally, as our organization’s mission has grown, so too, has our brand. An expansion of programs and services led to a need for change and, in late 2014, Devereux began a sweeping review of its name, brand promise and purpose – embarking on a comprehensive rebranding initiative. The goal was to clarify and amplify Devereux’s long-term vision and supporting strategy, and to guide its day-to-day operating focus with a robust brand that more fully embodied the breadth of the organization’s services, reach and impact. Exploring and establishing Devereux’s new brand identity was exciting and transformative, but it was not taken lightly. It was a tremendous undertaking and required significant input, time and talent from people across – and outside of – the organization. After two years of extensive research and planning with internal and external stakeholders, a new name and brand identity emerged – moving from the name Devereux to Devereux Advanced Behavioral Health. Our new tagline: Unlocking Human Potential. A strong brand is one of an organization’s greatest assets. Your brand aligns all of your organization’s constituents by guiding the creation of meaningful strategy and engaging staff at every level, which ensures your brand promise is kept for those the organization serves. Don’t lose sight of the ultimate goal: A strong brand represents the spirit of an organization and communicates a simple and incredibly powerful promise to constituents. 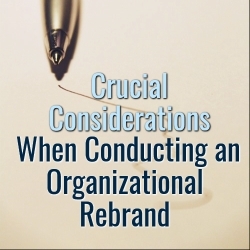 For a nonprofit that needs to satisfy not only its leadership and clients, but board members, donors, partners and other key stakeholders, checking all the boxes throughout the rebranding process can be daunting. Therefore, it is crucial to not lose sight of the overall goal: To help people understand, commit to and actively support your mission – and ensure your organization is working at its peak to fulfill that mission. Brand promise is everything: When it comes to rebranding, organizations may tend to focus on creative execution. Of course, designing a fresh logo and visual impact is important – it’s often the first impression you make on key audiences – but a strong brand is so much more than a cool or clever logo. A solid brand drives an organization to be disciplined in its operations and visionary in its strategy. Without the foundation of a strong, unique brand message, your creative identity will ultimately fall flat. Developing a brand message that embodies your mission and goals, aligns your organization’s day-to-day work and drives your long-term impact is far more critical. Engage all stakeholders: When developing a new brand, staff engagement is key – these are the people who live your brand every day. In addition, remember to be inclusive by gathering input from all external partners. For Devereux, that meant working closely with families, clients, community advisors, educators, donors, referring agencies, schools and health professionals to understand their perception of – and connection to – our brand and future direction. Connecting with all stakeholders provided us with important insight and feedback that served to strengthen our brand, build early buy-in and understanding of our rebrand initiative and allowed us to reinforce our mission and the value of our brand promise. Capitalize on the opportunity: While the work behind any rebrand effort is tremendous, it also creates an opportunity to generate excitement, engagement and pride among key stakeholders – and more closely align constituents and strengthen long-term strategy. The rebranding process is a critical time to re-tell your story to galvanize employees and remind clients, partners and other stakeholders about the critical work you do. Refresh all branded resources and materials: While this may seem obvious, leave no stone unturned when it comes to finding and updating all brand assets such as websites, business cards, letterhead and signage. Another consideration: make sure your marketing materials reflect your new brand not only in look and feel, but also in tone. Your new brand must suffuse all copy and communications, so that the brand mission and promise come across clearly. Communicate, communicate, communicate: Once an organization introduces a new brand, it can be tempting to think the work is done, but it is truly just beginning. The most important component of any rebranding effort is to inform and consistently engage all employees, partners and stakeholders. These are your brand ambassadors – and are the vehicles through which a new brand identity is cemented, and more importantly, through which a brand promise is upheld. Make sure these ambassadors understand how and why the brand is changing, and what that means to your organization and industry – and above all else, what that means to those you serve. Taking on the task of rebranding an organization is no easy feat, but if it is approached in a thoughtful, inclusive and disciplined way, the result will make a positive and long-lasting impact.